To me, one of the greatest joys of summertime is homemade ice cream. I love ice cream in general (how many people don’t? ), but homemade ice cream holds a special place in my heart. The slightly-softer-than-storebought texture, the depth of fresh flavors, the anticipation-generating wait required–homemade ice cream is a glorious part of summertime living. Of course, I can’t eat dairy anymore, and that can put a wee bit of a crimp in the ice cream-making. When I saw (one might even say drooled over) Molly’s fantastic-looking fresh mint ice cream, I wondered if I could make a version without eggs or dairy that would fulfill my summer craving and still taste authentic. I decided to give it a go, and combine the mintiness of Molly’s with the basic coconut-milk-based ice cream concept that Wardeh presented on her blog . . . with a bit of my own invention, as well. The result is a mint ice cream that is truly minty—not dairy-flavored, of course, but also not coconutty at all, as one might expect it to be. It is a more sophisticated mint flavor than I am used to tasting in my ice cream, almost like a mint tea ice cream instead of just mint. “It’s not Breyer’s,” I said to my husband after my first bite, but not being Breyer’s isn’t a bad thing. It’s just different. However, for that reason, I’m not sure that chocolate chunks are the most appropriate mix-in (especially not the 2 c. or so I dumped in the first batch . . .). Cocoa nibs would be an interesting contrast with a flavor that might better match the fresh mint. I’m also very curious how the ice cream would taste with peppermint leaves/stems or (my top choice to attempt) chocolate mint leaves/stems. (Chocolate mint, if you’ve never inhaled its lovely scent or consumed it, is a mint plant that actually smells/tastes like mint with a mild chocolate flavor.) We’ll certainly be experimenting with this recipe to see what we enjoy the most. For those of us who are dairy-free or for soy-free vegans, this ice cream method is a godsend. But several friends who can eat whatever they want who have eaten the ice cream have also exclaimed over its goodness. It’s definitely an ice cream you can savor while you stop to process the flavors in your mouth. And a chunk of this dropped into or blended with a tea or coffee beverage would be fabulous, I think. Note: To enable our ice-cream consumption to fall at a moderate level, we serve ice cream in small ramekins like you see in the photo at the top. Only one scoop of ice cream fits in each ramekin, which naturally sets us up to eat it in moderation (at least as long as we leave the ice cream container in the kitchen). One scoop mightily enjoyed without regret really is much more fun than a large bowl that leads to an uncomfortably full stomach. Wash 2 c. mint leaves and stems thoroughly. Heat 3 cans of coconut milk and agave syrup on medium heat until the mixture gives off plenty of steam but before it reaches the boiling point. Add the mint leaves/stems, cover, and turn heat to low. After 10 minutes, turn off the heat, and allow the mint leaves to steep an additional 50 minutes, covered, at room temperature. Strain out the mint leaves by pouring the mixture through a mesh strainer, pressing the leaves against the strainer to extract all of the mint flavor you can from the leaves. Discard the leaves and stems. Refrigerate the mixture until it is very cold. 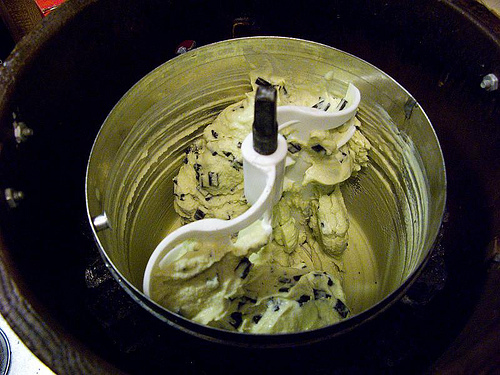 Once the mint mixture is ready to use, prepare the ice cream maker of your choice for use according to its directions. Remove the mint mixture from the fridge and pour it into a food processor. (A blender might also work fine.) Add the meat of one avocado, and blend until the avocado is completely obliterated into the mint mixture. Pour the mixture into the ice cream maker, and make ice cream! 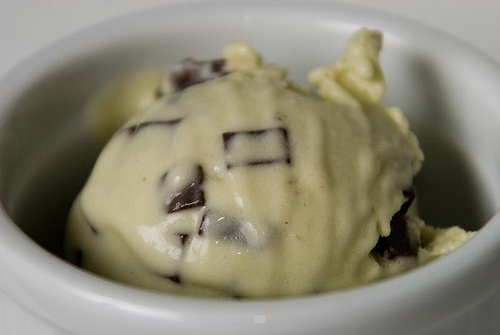 If desired, add 1/2 c. chocolate chunks or 1/2 c. cocoa nibs when the ice cream maker has a few minutes left. One thing I use to add green to my ice creams and sherbets is to put fresh spinach + the mix through the blender/processor. Makes it bright green!